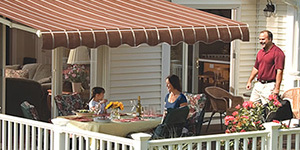 Butler Home Improvement is proud to be your local dealer for SunSetter Retractable Awnings. Discover just how affordable a beautiful SunSetter awning can be for your home! Butler Home Improvement provides property owners with the highest standard of retractable awnings from industry leader, SunSetter! The SunSetter products of motorized and manual awnings offer models and color choices to provide a custom look for your outdoor living space. Best of all, by choosing Butler Home Improvement for your SunSetter retractable awning, you will receive a hassle-free estimate, as well as, professional installation, and two-year warranty on all of our labor. 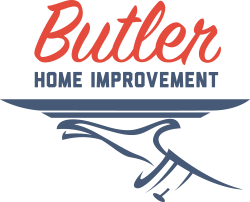 Butler Home Improvement serves St Louis, St Charles, O’Fallon, Collinsville, Edwardsville, Belleville, and the surrounding areas with high-quality retractable awnings, contact us today to get started! Why Choose an Outdoor Awning? A SunSetter retractable awning will transform your deck or patio into a beautiful “outdoor room” where you and your family will love to spend time. It’s a perfect place to entertain guests, eat, or simply kick back and relax. Our Dimming LED Lights will extend your awning enjoyment into the evening by allowing you to “set the mood” under your Motorized or VISTA awning. You’ll enjoy your time outdoors more than ever before. Don’t let hot, glaring sun or light passing showers drive you from your deck or patio. With a SunSetter, you control the weather. Enjoy the outdoors rain or shine. A SunSetter gives you shade and protection when you want it, but retracts when you want to enjoy the sun. A SunSetter is like having outdoor air conditioning – it can be up to 20 degrees cooler under your awning. Plus, with a rated SPF of over 50, SunSetters block 99% of harmful UV rays. That’s why the Skin Cancer Foundation recommends SunSetter Awnings as an effective UVA and UVB ray protectant. A SunSetter can even help cut your air conditioning costs. By blocking the sun from walls, windows, and sliders, your SunSetter helps keep the inside of your home cooler and prevents carpets and furniture from fading. By contributing to a reduction in your energy consumption, an awning can reduce your carbon footprint. With a SunSetter, you never have to compromise on beauty, quality, protection, or safe, easy, reliable operation. It’s a fact: You can pay more, but you simply cannot buy a better, higher quality awning than a SunSetter. You get custom-built features without the custom built price. That’s why you’ll find SunSetter gracing the decks and patios of over half a million Americans nationwide.